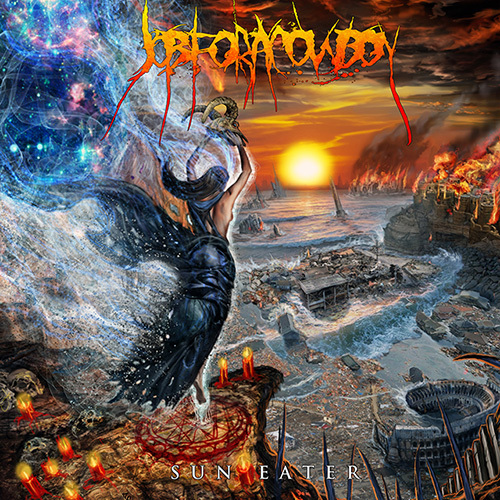 Job for a Cowboy – Sun Eater – Metal Blade Records – Out Now. It’s been nearly ten years since Job for a Cowboy debuted with their EP “Doom” in 2005 when they were still a deathcore outfit. By the time they released their debut album “Genesis” in 2007 the band was deeply rooted in death metal. According to the band their newest album “Sun Eater” makes them sound like an entirely new band, so let’s see if this album can stand on its own. This was a bit of a tough album for me to get into. Technical death metal usually takes me a few spins to get used to and “Sun Eater” is no different. Frequent time signature changes sometimes make it hard to know which song you’re listening to, but it’s well worth the effort. There’s a lot of melody to be found alongside the mix of old and new technical death metal style and the groove is infectious. While the style is mostly of the newer school, you can still hear throwbacks to very old technical death metal. The guitar duo of Al and Tony really gives the album a very full sound. And speaking of the sound quality; I love how audible the bass guitar is, giving the songs so much more texture. Extra props go to Jonny’s diverse vocals; from deep guttural grunts to throat pinching growls at times reminding me of a non-shrieking Dani Filth. Danny Walker might be a session drummer, but he plays along with the music as if he’s been with the band for years. It’s not a very easy album to digest, but it’s quite worth the effort. “Sun Eater” is a tough cookie to get through for people new to technical death metal, yet it’s worth a try. There’s enough melody to be found and the production is top-notch, giving you a very clear picture of what the band is creating.